Every land at Disneyland Paris seems like its bursting at the seams with brilliant detail-work, clever gags, and incredible design. The entire park feels like a lived-in place, and is the pinnacle of Imagineering in a castle park. Thematically, Disneyland Paris is the best castle park, bar none. For me, nowhere is that more clear than in Frontierland. Also known as Thunder Mesa (which is actually the town within Frontierland, but I love the name, so I just lump everything into Thunder Mesa), this is unquestionably my favorite Frontierland in the world. I’ve spent hours just wandering this land, as I love the vibe and discovering new details I’ve overlooked in the past. While others favor the exquisite Main Street (also the best in the world) or the Fantasyland anchored by the best Disney castle in the world, I’m team Thunder Mesa all the way. Not that I’ve ever thought about this or anything, but if I could put a rocking chair at any spot in any of the parks in the world and sit there as sunset transitioned to evening, the front porch of Phantom Manor would be very high on my list. 7. Lounging at Lucky Nugget – Lucky Nugget Saloon is the Paris version of the ‘Horseshoe’ restaurants in the United States parks, but this really feels more akin to a western saloon. Lucky Nugget is defined by its rich woods, earthy color scheme, and ornate detail-work. The colors of Lucky Nugget Saloon evoke a sense of warmth, plus maybe leather, beer, and bourbon. The story of Lucky Nugget Saloon is fun, albeit not the most convincing. It was founded by Miss Diamond Lil, who charmed a miner into giving her a guided tour of Big Thunder Mountain. During the tour, she had the good fortune of finding a golden nugget the size of a loaf of bread and obviously she was allowed to keep it, because that’s how things like that work. This enabled her to create Thunder Mesa’s grandest Western saloon, founded in 1858, where patrons could kick back and enjoy the most ‘foot-stomping, hand-clapping show west of the rockies’ with Miss Diamond Lil as the main show-girl. 6. Businesses and Proprietorships – From Tobias Norton & Sons to Big Thunder Photographer, there are a ton of mom & pop businesses that have sprung up in Thunder Mesa. Perusing the gift shops and simply looking around at signage makes Frontierland feel like a lived-in place. It’s also illuminating in terms of backstory. You get the sense that some of these businesses are opportunistic, springing forth during the gold rush trying to capitalize on the new-founded wealth. Other businesses seem to pre-date that, or have nothing to do with the gold rush, whatsoever. It’s interesting to think about how everything coexists, and works together to reinforce the larger theme. 5. Natural Wonders on the Rivers Of The Far West – To get the full impact of the natural scenery along the Rivers of the Far West, you need to take a cruise aboard the Molly Brown. Following its refurbishment prior to the 25th Anniversary, this whole river loop looks wonderful. The “Old Unfaithful” geysers are my favorite aspect of the Rivers of the Far West, and provide a nice counterpart to Big Thunder Mountain Railroad. It’s really too bad the canoes and River Rogue Keelboats no longer operate, as there are so many details it’d be nice to see from a closer and lower perspective. 4. Relaxing by the Fire at Cowboy Cookout BBQ – Cowboy Cookout BBQ is in the Cottonwood Creek Ranch barn, in an area that reflects an agricultural community on the outskirts of Thunder Mesa. Cowboy Cookout BBQ has a couple of things going for it. First, it’s my favorite counter service restaurant at Disneyland Paris, food-wise. Second, it has a laid-back rustic design and inviting communal atmosphere. The fire pits located around the seating area create a cozy atmosphere, which is absolutely perfect for those cold fall and winter evenings when the parks dip into frigid territory at Disneyland Paris. Even on a normal day, taking an afternoon break from the chaos of touring and resting in a place where everything seems to move at a slower pace is a welcome respite. It’s this atmosphere–and rustic design–that makes this one of the Top 10 Themed Restaurants at Disneyland Paris for us. 3. Big Thunder Mountain Railroad at Night – Disneyland Paris’ version of Big Thunder is perfection. It’s arguably a top 10 attraction in the world, and also arguably the best ride in all of Disneyland Paris. (Phantom Manor and Pirates of the Caribbean might beg to differ.) At the very worst, it’s top 20 and top 5, respectively. A recent ‘blessing in disguise’ for me was the realization that I don’t care for Disney Illuminations nearly as much as I enjoyed Disney Dreams, making the Disneyland Paris nighttime spectacular skippable for me. Instead, I’ve allocated that time to late night rides on Big Thunder Mountain Railroad (which is nearly a walk-on during Disney Illuminations), and that has pretty much been a revelation. The lighting, atmosphere, views from the line–it’s all so much better at night, and it’s pretty good during the day! 2. Phantom Manor’s Stately Grounds at Sunset – At the top I indicated that I’d love to sit in a rocking chair on Phantom Manor’s porch as sunset transitioned to evening. That’s obviously theoretical, partly because there is no rocking chair and partly because it would take every fiber of my being to sit still and “relax” during a beautiful sunset overlooking Frontierland when I could be running around Phantom Manor’s queue photographing it. Part of the appeal of these grounds at sunset is that they are elevated, giving you an almost-aerial view of Thunder Mesa. Another part is that the ‘estate’ of Phantom Manor is huge, contains tons of foreground interest and natural leading lines, and is just a joy to explore and photograph. I’m always drawn to Phantom Manor at sunset, and I’ve walked that queue without doing the ride more times than any other attraction! 1. The Backstory – This blog spends a lot of time–perhaps an inordinate amount of time–criticizing backstory that I perceive as lipstick on a pig, pointless exposition, or subterfuge to obfuscate poor theming. We love good theme and backstory can be part of that, but all too often it’s used as a crutch rather than an organic enhancement. The backstory of Thunder Mesa is a master class in backstory done right. Much of it can be gleaned from walking through the land itself, enjoying the attractions, queues, restaurants, and details throughout. While there are morsels of the full story that do require reading further background, much of it is evident from normal exploration of Frontierland, and simply paying attention. More importantly, the backstory is actually good, logical, and gives you a deeper appreciation of Thunder Mesa. It doesn’t exist to explain away thematic shortcomings; it’s a true enhancement. I love the story behind the rise and fall of this little gold rush town, how it parallels real life, and the mythos surrounding it all. It’s a nice way of tying disparate attractions together, and it makes me feel invested in the story of Thunder Mesa. If you’ve visited Disneyland Paris, what’s your take on Thunder Mesa? Did you pick up on the backstory? What did you think of their versions of classic Disney attractions? Dine at any Frontierland restaurants? Any questions? Hearing your feedback about your experiences is both interesting to us and helpful to other readers, so please share your thoughts or questions below in the comments! Even better: when artistic French pumpkin scarecrows are added in the fall! I love the collection of antique machinery around Thunder Mountain entrance and beyond; best-themed area of DLP, for sure. This area was largely construction walls during our visit. I hope we make it back someday to enjoy that part of the park. Since I love Frontierland at WDW and DL, I look forward in the furture to DLP’s version. Phantom Manor was the first ride we rode at DLP on our visit last fall but now I have no recollection of any of those details. We did take a long loop past Big Thunder trying to get back to the hub and dead ended in a land devoted to Coco….I feel like I missed something of all the magic you described! Guess I’ll have to go back. All I’ve been reading as of late, is how much superior other parks are compared to Disneyworld, which only fosters more contempt for current corporate leadership. Why doesn’t this kind of detail warranted at DW, because it doesn’t need to be! People continue to pack in without it. Beginning to think that I need a new vacation spot. I haven’t been to Shanghai or Hong Kong but I’ve been to every other park. DLP’s Frontierland is my favorite land of any Disney park in the world. Thank you for this tribute! I would like to to request an article about the differences between the different parks Disney has compared side by side. For instance the fast pass plus that is in WDW. Has that been adopted across the board in parks overseas or they on tickets like in the past at WDW. How do crowds and wait times in other parks compare to WDW. Since all the changes that WDW has put in Place we are not going to Florida. But will be traveling to Europe and other destinations where we could go to another Disney park over seas and wonder If they are seeing same issues as discussed last few weeks about WDW. Fastpass is normal paper in Tokyo and Paris at least and I believe it is in others too. Wait times depend on season just like WDW, and Tokyo can be incredibly busy because of sheer population density. It’s well worth visiting the other parks, they’re generally smaller and better themed with a number of great unique attractions. Thanks Jay for the information. This post is spot on – Frontierland is my favourite area in DLP! I love every bit of it. The Phantom Manor looming over the land, the cemetery right at the edge with its view over Thunder Mesa. It is the little details really make it, tiny things like way the street lights develop as the century progresses through the park. I even love the fort, with its odd little mannequins showing the history of the wild west. One of my favourite memories of the park from a few years back is walking through there at night, just as the fireworks were about to start. The place was just about empty and there was such an eerie calm, it was absolutely perfect. My partner loves with the Discovery and Liberty Arcades on Main Street. Each time we go we HAVE to walk down them, enjoy the gas lighting and look at the patents. 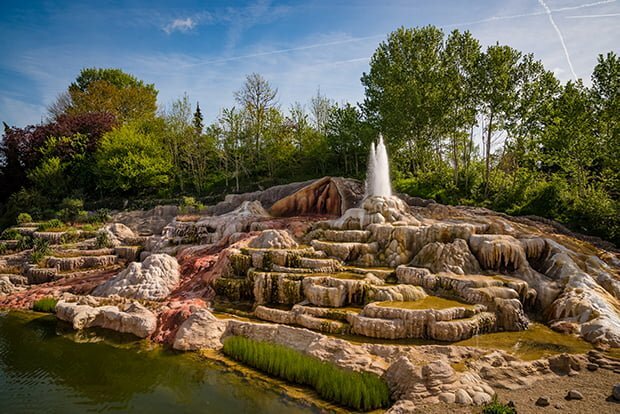 I think my top seven for DLP would be: 1) Phantom Manor, particularly the cemetery 2) the Nautilus (terrified me as a child, love it as an adult) 3) the aesthetic of Discoveryland and the Columbiad cannon 4) Big Thunder Mountain 5) Agrabah Cafe (some of the best food in the park) 6) The Dragon’s Lair 7) Alice’s Curious Labyrinth. When we went to WDW I was surprised to find the things I loved from DLP were not there – even small things like the lack of a grand entrance to its a small world – but of course we just found a whole different set of things to love there instead. This has turned into a bit of an essay – really just want to say post is excellent, as always! Looks and sounds just lovely. On my bucket list! I really appreciate these types of posts! I’ve yet to visit Disneyland Paris and this has made me realize there ARE certain unique qualities there to experience. I agree completely with everything written here, even if I may be partial a bit more toward Fantasyland (ah…. the view from Queen of Hearts castle…), but DLP Frontierland is certainly a masterpiece. Just a puty the area around the Chapparal Theathre and train station looks a bit abandoned now. I remember fondly the canoes, such a shame they’re not in operation anymore.